Daratumumab, a monoclonal antibody that targets CD38, has demonstrated efficacy in combination with Rd or Vd in patients with previously treated multiple myeloma. Two large clinical trials showed that daratumumab-based combination regimens reduce the risk for disease progression or death in patients with multiple myeloma. 1. National Cancer Institute. A snapshot of myeloma. November 5, 2014. www.cancer.gov/researchandfunding/snapshots/myeloma. Accessed December 22, 2016. 2. National Comprehensive Cancer Network. NCCN Clinical Practice Guidelines in Oncology (NCCN Guidelines): Multiple Myeloma. Version 3.2017. November 28, 2016. www.nccn.org/professionals/physician_gls/pdf/myeloma.pdf. Accessed December 27, 2016. 3. Multiple Myeloma Research Foundation. About multiple myeloma: learn the basics about multiple myeloma. www.themmrf.org/living-with-multiple-myeloma/newly-diagnosed-patients/what-is-multiple-myeloma/. Accessed December 23, 2016. 4. American Cancer Society. What are the key statistics about multiple myeloma? Revised January 2017. www.cancer.org/cancer/multiplemyeloma/detailedguide/multiple-myeloma-key-statistics. Accessed February 24, 2017. 5. Mayo Clinic staff. Diseases and conditions: multiple myeloma: complications. December 4, 2015. www.mayoclinic.org/diseases-conditions/multiple-myeloma/basics/complications/con-20026607. Accessed February 23, 2017. 6. Petrucci MT, Giraldo P, Corradini P, et al. A prospective, international phase 2 study of bortezomib retreatment in patients with relapsed multiple myeloma. Br J Haematol. 2013;160:649-659. 7. NCI staff; for the National Cancer Institute. Three new therapies approved for multiple myeloma. January 6, 2016. www.cancer.gov/news-events/cancer-currents-blog/2016/fda-threedrugs-myeloma. Accessed December 23, 2016. 8. Teitelbaum A, Ba-Mancini A, Huang H, Henk HJ. Health care costs and resource utilization, including patient burden, associated with novel-agent-based treatment versus other therapies for multiple myeloma: findings using real-world claims data. Oncologist. 2013;18:37-45. 9. Garrison LP Jr, Wang ST, Huang H, et al. The cost-effectiveness of initial treatment of multiple myeloma in the U.S. with bortezomib plus melphalan and prednisone versus thalidomide plus melphalan and prednisone or lenalidomide plus melphalan and prednisone with continuous lenalidomide maintenance treatment. Oncologist. 2013;18:27-36. 10. Darzalex (daratumumab) injection [prescribing information]. Horsham, PA: Janssen Biotech; November 2016. 11. US Food and Drug Administration. Daratumumab (Darzalex). www.fda.gov/Drugs/InformationOnDrugs/ApprovedDrugs/ucm530249.htm. Accessed December 23, 2016. 12. Dimopoulos MA, Oriol A, Nahi H, et al; for the POLLUX Investigators. 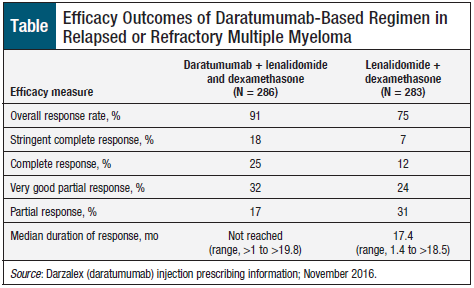 Daratumumab, lenalidomide, and dexamethasone for multiple myeloma. N Engl J Med. 2016;375:1319-1331. 13. Palumbo A, Chanan-Khan A, Weisel K, et al; for the CASTOR Investigators. Daratumumab, bortezomib, and dexamethasone for multiple myeloma. N Engl J Med. 2016;375:754-766. 14. US Food and Drug Administration. FDA approves Darzalex for patients with previously treated multiple myeloma. Press release. November 16, 2015. www.fda.gov/NewsEvents/Newsroom/PressAnnouncements/ucm472875.htm. Accessed December 23, 2016. 15. Janssen Biotech. Darzalex Reimbursement and Access Guide: important information to support the reimbursement process. www.darzalexhcp.com/shared/product/darzalex/darzalex-reimbursement-and-access-guide.pdf. Accessed December 23, 2016.